Ultimate comfort, quality relaxation, sprawling luxury. No chair design exudes these traits like the reclining chair, which can be found in first class cabins and higher-end movie theaters. Reclining chairs are generously padded and have an adjustable headrest and footrest for whole-body support and angling for optimal comfort. 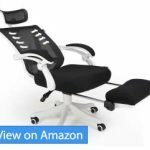 Ergonomic and multi-functional, they also offer a a much greater range of recline, with the footrest supporting the lower limbs in a reclined position. 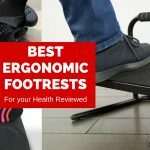 Here’s my list of the best reclining chairs with footrests in 2019 that offer ergonomic support while letting you choose between work and play. And for outdoor use, check out my guide on the best zero gravity reclining chairs you should check out. We’re a big fan of the Duramont brand for its high quality office chairs and attention to customer support. 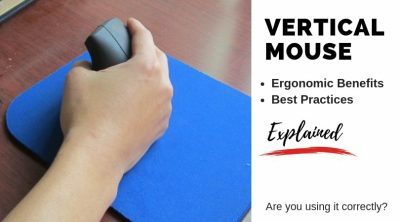 The Duramont Reclining office chair doesn’t disappoint either, taking the top spot in our list of the best reclining office chair you can get. Think of this chair as a luxurious executive chair with the added perks of an ultra steep recline angle of 150 degrees, plus a pull out footrest that’s very easy to operate. Combine all of these elements, and you have an office chair that not only looks and feels good while you work, but also fully supports you in kicking back and taking a nap every once in a while. The shape of the Duramont Reclining Chair is optimized for comfort, unlike many leather office chairs. This means a waterfall seat edge to reduce tension in the back of your thighs, plus a protruding neck area to cushion your neck. 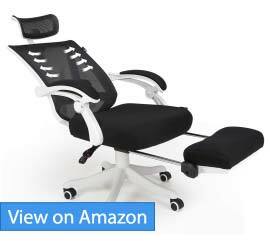 the lumbar support isn’t adjustable but adequate for most people. Sadly the armrests are not height adjustable due to the one piece design that have them move in sync with the backrest. As mentioned in the beginning, apart from excellent build quality, what we love about the Duramont brand is their superb customer service. Apart from an unconditional 90 day money back guarantee, if you experience any issues with their chairs, you can expect a speedy resolution. Now that’s piece of mind. Easy to operate flip out footrest. Backrest reclines but does not rock. 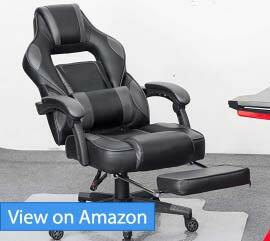 Whether you’re in a race in Need for Speed or a race to meet a deadline Killabee’s reclining gaming chair provides excellent ergonomic support while letting you take comfortable naps in between. 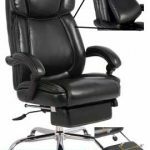 This chair provides one of the very best values in a reclining office chair that just happens to suit gamers as well with the flamboyant style and colors. The chair is available in blue, grey, red, or white variants. Like the Duramont chair, the Killabee features a high degree of recline. The chair can be reclined and locked at any position between 90–175 degrees. This is an awesome feature that lets you find the most comfortable angle to stretch your back, read the newspaper, or even take a nap. At 175 degrees, your body is almost horizontal, allowing you to doze off with ease. 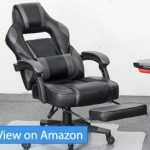 The large lumbar support cushion is attached to the chair via straps and can be lowered or moved up if you wish to rely simply on the contoured segmented padding for comfort. Some reviewers note that the padding is slightly firm in the seat area, but breaks in over time. Others have said that the chair doesn’t provide enough cooling, so it may not be ideal to sit on for extended periods during summer. Like Duramont, Killabee has established itself a a gaming chair company that actually focuses on quality and customer support to separate itself from the dozens of no name gaming chair companies that come and go. 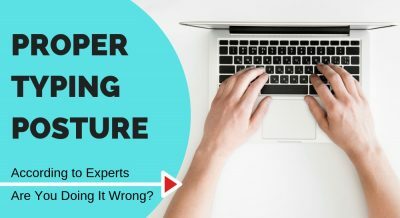 Apart from the 30 day money back guarantee, many customers have voiced just how responsive the company was whenever they had an issue with the chair, evening sending a replacement. PU leather does’t dissipate heat well. If you’re looking for a reclining office chair with a mesh back to better cope with the hot summer days as you work, you can do a lot worse than the Hbada Reclining Office chair. 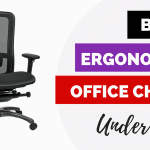 I’m a big fan of the Hbada brand when it comes to office chairs, where you will often find innovation and ergonomic features usually reserved for much more expensive chairs. 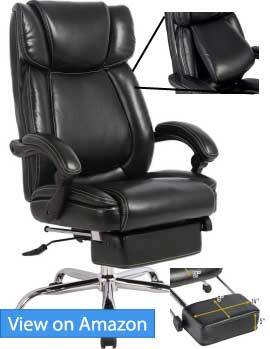 The Hbada Reclining office chair is no different. 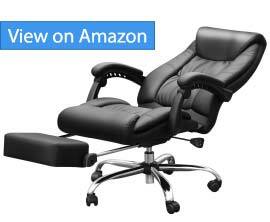 It comes with excellent adjustability all around, from the headrest, lumbar support, to a high degree of recline. This reclining chair has an impressive recline range of 90–150 degrees that basically let you turn the chair into a first class cabin seat. In terms of ergonomics, the Hbada takes the cake for the most adjustable back and headrest out of all the chairs in this list. Made of breathable mesh, both the lumbar and headrest is height adjustable, letting you dial them in to contour to your body precisely when you lay back. Furthermore, the headrest can be rotated 30 degrees to fit the shape of your neck better. I love the exoskeleton, futuristic design of the Hbada. Many people shared the same sentiment, saying how the chair has elevated the look of their entire office. 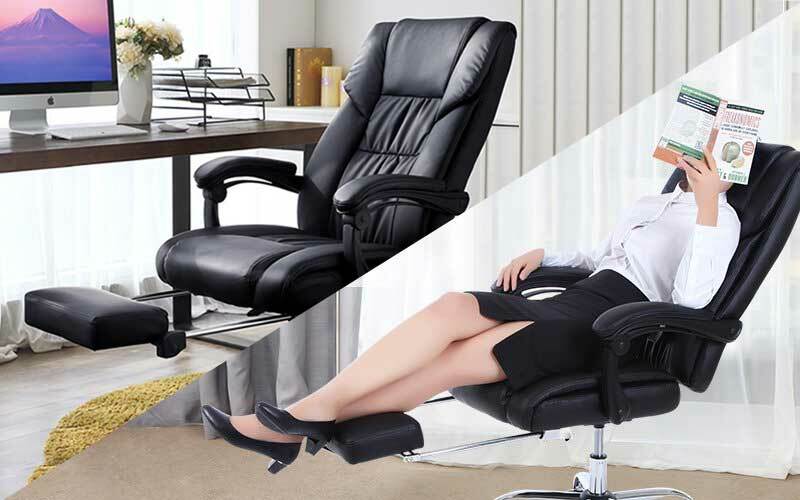 All in all if you’re looking simply for a sleek reclining office chair with mesh covering and a great deal of adjustments, the Hbada Reclining Chair is your best option. High degree of reline from 90 degrees to 150 degrees. Like many office chairs, the Merax Inno reclining chair has an S-shaped backrest that is contoured to the natural curvature of the spine. Even more impressively, the lumbar cushion can be pulled outwards to support your back even when you’re leaning forward. It’s an interesting if not nice touch. I like the smooth doubly-stitched PU leather that covers the entire chair, including the armrests. It’s not as breathable as mesh, but damn does it feel good, especially given how thick the padding is all around. The Merax Inno isn’t called a napping chair for no reason- it can recline all the way back to 180 degrees flat. Yes, it lets you lay completely flat in your chair to literally take a nap. Too bad the footrest on the Merax Reclining is on the small size, measuring 14″ W x 9″ H. For larger users, you may have to cross your legs for both feet to stay on the footrest. The chair has a seat height of 18.5–20.5 inches, a seat depth of 21 inches, and an overall height of 39.5–49.5 inches. Garnering mostly favourable reviews, this chair seems to be holding its figurative and literal weight (which is a maximum of 225 pounds). There were some minor design issues but it is all in all a solid purchase. Imagine reading a book by a fireplace in an oak cabin on a winter night — this is the chair to have. In contrast to the four reclining chairs listed above, this chair from Flash Furniture consists of two pieces. The chair itself (resembling a high-end salon chair or a chair Captain Kirk would buy for the U.S.S. Enterprise) does not have an extendable footrest, instead coming with a separate ottoman (which has the same height as the seat). Though this is a perfect addition to the living room, it is also a great fit for the study. The whole set is aesthetically pleasing, with a full black polyurethane leather padding set in a swivelling mahogany frame. Do note that the leather is synthetic and may be prone to flaking over time; some users have also mentioned that there is an initial chemical smell that should recede over time. It is generally easier to swivel with the more stable circular base compared to the five-pointed base. The reclining angle can be manually adjusted by a lever for that old-school feel. The chair’s seat depth is 21 inches. Its height is lower than the chairs listed above, measuring only 14 inches from the floor (which may be too low for some). The weight capacity is 250 pounds. In general, the chair is easy to assemble, although some users have reported quality control issues where the screw holes for the chair parts didn’t line up. 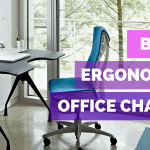 Getting an office chair that reclines is beneficial to your posture and ultimately your health because it can support your body in its natural curvature. A reclining chair alleviates some of the weight from gravity on the spine and joints and instead distributes it to the chair – it’s why so many elderly people have recliner chairs. Moreover, sitting at an angle improves circulation because by propping your feet up you may slow the rate of blood pooling in your legs than if you were to put your feet on the floor. Reclining can open up the airways and prevent you from slouching (which is a common postural error when sitting upright). Plus it helps you relax, and who doesn’t want less stress? In keeping with ergonomics, many reclining chairs are departing from only having an adjustable reclining feature to more functions like seat height and lumbar seat angle (as seen in many of the above chairs). These multi-functional reclining chairs embody the best of both worlds for exceptional comfort and body support. 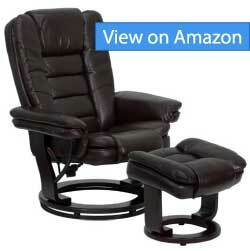 Reclining chairs also set themselves apart from other chairs with the pull out footrest. 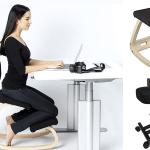 The footrest provides comfortable ergonomic support of the lower limbs because it is usually well-padded. Users can rest their feet on the footrest, which has a gentler tilt angle compared to waterfall seats. Providing a point of contact at the feet reduces weight on the back thigh and therefore the pressure on the blood vessels in that area, even if your chair has a waterfall seat. The footrest complements the reclining aspect of reclining chairs to provide that tilted angle, which confers the health benefits mentioned above. With a footrest, it also opens up the possibly of laying almost completely horizontal for comfortable naps. 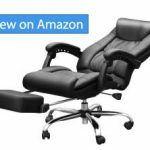 Some of the reclining office chairs reviewed above come with removable pillows that definitely come in handy for activities such as napping or watching a movie on the computer. In contrast to rocking chairs, reclining chairs are optimal for extended sitting periods because they can be adjusted to a certain angle (though I recommend taking standing breaks often to help your circulation and muscle tone). 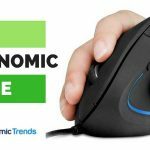 The 5 reclining office chairs reviewed here all combine comfort, ergonomics, and a high level of recline to create the very best reclining chair you can get at those price points.